Limit Exchange 2010 Email Attachment Size for users with PowerShell. | Chinny Chukwudozie, Cloud Solutions. ← Migrating DHCP from Windows Server 2003 SP2 to WS 2012 R2 Platform . 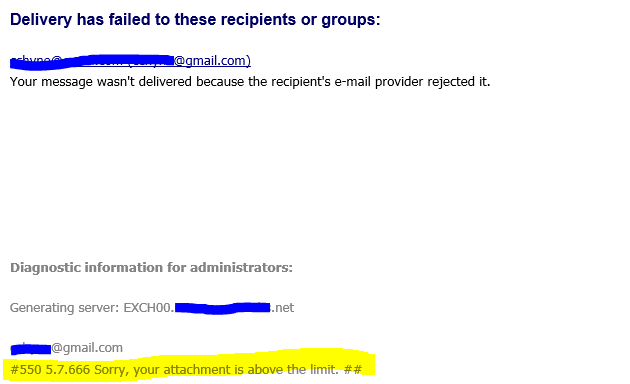 Limit Exchange 2010 Email Attachment Size for users with PowerShell. 1) I created a distribution group. 2) Added the required users to the group. 3) Did some quick research and decided on using the New-TransportRule cmdlet to achieve the objective. 4) Set the AttachmentSizeOver parameter to the requested value of 300KB, the SentToScope is set to NotInOrganization (only emails sent Outside the organization) and all other parameter values are set as indicated in the script. This entry was posted in Exchange 2010 SP2, Exchange Cmdlets, Exchange Management Shell, Microsoft Exchange and tagged Exchange 2010 SP1, Exchange Management Shell, Limit Email Attachment, Microsoft Exchange 2010, PowerShell, Size Limits. Bookmark the permalink.